A final game of the season for City, and what a way to go for it! Skipper Adam Sayer had counted how many different players have represented the 3rd XI this season, arriving at a total of 50! (probably explaining the appearance of a few grey hairs) To continue in this vein, City arrived in Kettering with only 10 players. Up against it from the start! Kettering soon scored their first and then again to take an early lead. Decisions went against City and the extra player for Kettering was punishing City, as all players were working hard to chase the ball. Kettering played well and took their chances, leading 6-0 at halftime. The second half saw City hold back the attacks more often, but Kettering managed to score a few more goals. There was a glimmer of hope for City when a Rees Leonard drag flick from a short corner went in. However celebrations were short lived, as the umpires ruled that it was taken out of the D. The game finished 8-0 to Kettering, who played a good game and were good hosts. I would like to thank everyone of the 50 players who has helped the 3rd XI this season, in particular the regular core players who have turned up week in and week out, no matter where the game has been. Having lost 9-0 to Bury earlier in the season, and knowing a win for Bury would result in their promotion, City knew they would be facing a tough game. With the Gresham's contingent arriving via Hyatt Transportation Services, City were once again, mainly fielding a team where the average age was below 20. City started incredibly well and passed the ball between each other, with all players linking up well. Sam Hyatt joined Skipper Adam Sayer in the middle at the back, and made some confident tackles and distributed the ball well. Cameron Husband and Tobias Leonard both equally played well either side. Under mounting Bury pressure, a short corner was conceded and Bury put it away, taking the lead. However, it wasn't long before City equalised when an aerial from Tobias Leonard found the forward lines, and Joe Holden (yes you read that correct), smacked the ball into the netting. It wasn't long before Bury took the lead again, then scored another just before half time. City started the second half strong but as legs tired and the passing dropped, Bury saw openings and punished City. Special mention to keeper Bobby Rash who made some terrific saves. Final score 7-1 to Bury, who secured their promotion. POM: Tobias Leonard - Not the only Leonard who can aerial. After narrowly losing earlier in the season 5-4 to Dereham, City were looking forward to this clash with a team who recently found out they were in danger of being relegated also with changes to the league structure. City welcomed Alex Tomkinson and Liam Parker-Dennisen to the team, and also the evergreen Jason Hyatt (helping Captain Adam Sayer to bring up the average age of the team). City started brightly and passed the ball well, however they were coming unstuck when trying to force the ball through the middle. This allowed Dereham to attack and showcase the physical aspect of the game, which City struggled to match at times. TYFC: Jason Hyatt - Seeing green! With a bare 11 City travelled to Cambridge for the second time this season, but this time they had a keeper! Cambridge started strong and City were under a lot of pressure, and struggled to get the ball out of their half. Obviously Cambridge were determined to better the draw result that occurred earlier on in the season. Despite the noble effort of Rees Leonard and Simon Black in the centre at the back, Cambridge managed to break through and scored a few goals. There wasn't much keeper Luke Elwes could do when Cambridge had overloaded the D and passed the ball around the defence. 5-0 down at half time. City kept up their pressure and Jonty Black was causing all kinds of problems in the middle of the pitch. Matthew Brine led from the front and certainly gave the Cambridge defence cause to worry, but unfortunately on this occasion was unable to convert chances. The work rate of City was excellent the second half, and this was epitomised by Nick Hooper who appeared everywhere. As always, Lloyd Sayer and Tobias Leonard held the middle and linked up nicely with the forwards. Keeper Luke Elwes deservedly earned his Man of the Match award, making some crucial saves to keep City in with a chance of winning the second half, with one even deflecting off the crossbar. With tiring legs, City let Cambridge score another, however City weren't finished yet. A string of successive short corners, resulted in Rees Leonard scoring a fine drag flick making the second half 2-1 to City. The final 5 minutes saw Captain Adam Sayer have a sit on the Naughty Step after the ball hit his foot when a Cambridge player would otherwise have been free on goal, and a last minute short corner for Cambridge was well defended by City to leave the final score at 6-2 to Cambridge. Well done to all those players who travelled and played in the Cambridge sunshine. Big thanks to nick Hooper whose appearance ensured City had the 11 players needed to play. City played Dragons 1s in a rearranged fixture on a very sunny and warm February afternoon. City started well and put pressure on Dragons by passing the ball beautifully around. The inside trio of Lloyd Sayer, Ben Chapman and Jonty Black linked up well with the forwards, and cut out any balls that were coming through. Dragons rallied and started to make some attacks on the City defence but the stalwart Simon Black put his body on the line and blocked a few shots heading to keeper Luke Elwes. Eventually Dragons managed to win a couple of short corners, however, these were defended against, and City won their own at the opposite end. Unfortunately the chance was not converted and it was still goal less at half time. Dragons put a lot of pressure on City early on and City struggled to get the ball out of their half. Even with the tireless efforts of 3rd team debutante Jason Hyatt, City just couldn't string many passes together. Dragons were able to counterattack a number of times, and due to either tiredness, poor marking/tracking, the loss of Jonty Black to injury (or shall we blame second half on the unseasonably warm afternoon? ), scored a succession of goals which saw them take the victory. A good performance in the first half for City, which unfortunately they couldn't sustain the second. Well done to all those younger players in the squad who show good promise for the future of the club. TYFC: Captain Adam Sayer - Spent more time on the ground than on his feet. With availability good this week and a goalkeeper, City hosted Bourne Deeping 2s at Taverham. Narrowly losing 4-3 in an earlier fixture, City knew this was a game that they could win. City started well and put a lot of pressure on Bourne and it wasn't long before they took the lead. Seeing as the writer of this match report plays at the back, and due to the abundance of goals in this game for City (something not that common this season), memory is shaky of who scored which goal. Suffice to say, it was a cracker and City were lifted. However, as has been common this season, City like a challenge, and so decided to let Bourne respond by scoring two goals, taking the score to 2-1 to Bourne at half time. The second half started and City soon found themselves 3-1 down, but then City emerged like a phoenix from the flames, and started their biggest comeback this season. Lloyd Sayer and Ben Chapman commanded the middle of the pitch and this lead to City scoring more goals! Again, this lowly writer can not remember who scored all the goals in a certain order, but goals came twice for Rees Leonard from short corner drags, one from Dan Cheeseman, one from Jack Luther, another for Toby Pallister, and a cracker of a goal from Henry Baker, who deftly touched deflected the ball in from a Rees aerial. City didn't make it easy for themselves as poor passes and lack of marking, led Bourne to get another goal, and pressure on City resulted in a number of short corners against them. A goal line save from Skipper Adam Sayer, and another goal line save from Rees Leonard, kept City in it. The dying moments of the game did add a few grey hairs to skipper Sayer, but after City went two goals into the lead in the last 3 minutes, it was clear City would win. At last a win for City this season. An outstanding team performance by all, who battled from two goals down to win two goals in front! Special mention to the younger players of the team who all played brilliantly. MOM: Rees Leonard - Goal line save and shot corner maestro. CITY DIDN'T MAKE IT EASY FOR THEMSELVES.. HEADLINE: City didn't make it easy for themselves..
City travelled to St Ives with 12, ( yes that's right, a sub! ), after Nathan Corden and Henry Baker valiantly stepped up to make sure City had enough players to field a team. After drudging through the monotonous roadworks of the A14, (Skipper Adam Sayer making a mental note to return to Norwich via Ely), City arrived, warmed up, and were playing within 7 minutes of the previous game ending. St Ives definitely took advantage of being the home side, putting City under pressure from the start. It wasn't long until St Ives opened the scoring, finally beating keeper (and MOM) Ben Millet, who had been keeping City in the game. It also wasn't long until St Ives knocked in another 2 goals... City knew they had to get their game heads on and work hard if they were going to stop any more goals. Rees "I can chuck an aerial really far" Leonard worked well with fellow centre back Simon Black to marshall the City defence, and Rees set a new Guiness Record for the amount of aerials thrown in one game! Well done! Cameron Husband and Nathan Corden provided outlets down the sides of the pitch, whilst Skipper Adam Sayer attempted to hold off the St Ives attack down the middle (judging by the scoreline, not very well!). Tobias Leonard and Will Kidner worked tirelessly throughout the game and were key link players between the midfield and forwards. City had a couple of moments in the second half where they tested the St Ives keeper; with a few short corners and a reverse stick shot from Dan Jeffers. Sadly for City, the relentless attack of St Ives, benefiting from a number of subs, were able to over run the midfield on numerous occasions and passed the ball into the goal. Special mention to Toby Pallister, Henry Baker and Jonty Black, all whom worked hard and didn't give up throughout the game. Next week City face local rivals Norwich Dragons 1s. MOM: Ben Millet - Excellent saves and work rate. City hosted Pelican first team at Taverham on a chilly afternoon. With a few new faces again in the line up, City took a few minutes to settle into the game. Once they did, City dominated play for a good 10 minutes, with even centre back Adam Sayer finding himself in the opposition's D. Unfortunately this pressure didn't result in a goal, and soon Pelicans were piling on their own pressure, taking advantage of counterattacks to test the City defence. A combination of marking errors and poor passing culminated in 7 minutes where City shipped a few goals: one from a nice deflection, one from a short corner strike, and another from a penalty flick, after Simon Black's valiant efforts to keep the ball out of the goal. City kept their heads up, and Jonty Black in the middle of the pitch caused no end of trouble for the Pelican midfield. Lloyd Sayer distribute well and linked up nicely with forwards Rees and Tobias Leonard. Again, City fell victim to a Pelican attack and at half time found themselves trailing 4-0. The second half was a more even affair, with City and Pelicans both having short corners. Pelicans did score again, but it was Will Kidner who managed to bag City's goal from a short corner deflection from Rees Leonard. Once again, City worked up to the last minute and sadly ended without any further goals . MOM: Jonty Black - excellent work in the midfield and unlucky not to score! TYFC: Skipper Adam Sayer - swing and a miss on the reverse ( stick to defending). With call ups for Simon and Jonty Black, Dan Jeffers and Johnny Pyatt, City travelled away to Long Sutton and found a very sandy pitch, the nasty sort which gets everywhere! City were under pressure from the start and centre backs Adam Sayer and Simon Black both took balls hit to their bodies from Long Sutton strikers in the first 5 minutes. A goal came for Sutton from an impressive reverse stick strike from an acute angle, defying the laws of physics. City then started to play the ball around and Johnny Pyatt was causing all kinds of trouble down the right side of the pitch. This resulted in him being taken to the ground a number of times as the opposition tried to keep pace with him, somebody call a medic! Keeper Luke Elwes put in a MOM display to deny Sutton numerous times, and kept the scoreline respectable. Excellent play by Jonty Black in the middle led to some chances on goal for City, and a few short corners sadly were not taken advantage of. Long Sutton managed to sneak another goal after overloading a breakaway. The second half was much the same; City passing well and putting in effort, whilst Sutton would look to counter attack. With City only having a bare 11, and becoming increasingly tired, Sutton did manage to overload the middle at times and did score twice again in the second half. On another day if City had fresh legs to come on the pitch, the score may have been different. Well done to Jonty, Simon, Dan and Johnny for slotting into the 3s so effortlessly. Having played all the teams in their league, City faced their first opponent of the season, Peterborough 3s, hoping to improve on their 3-1 loss from before. The 3s line up was once again different from the week before (well, what did you expect? ), but City didn't let this affect their play as they scored within the first 5 minutes! A lovely ball from Lloyd Sayer found Tom Cox, who passed the ball to Rees Leonard, who added to his tally this season (not nearly as much as last season!). Half time and 1-0 to City. Now a gambling man would look at the few previous week's results and would bet that having the lead at half time, City would surely throw away the game and lose it in the second half as they have done on more than one occasion this season ( 4 in fact!). The second half started and City faced up to Peterborough who were determined to get an equaliser. Midway through the half, their chance came. A hit ball from a long corner at the side of the pitch, found it's way straight into the City D and onto the stick of the Peterborough, who deflected the ball behind himself into the corner of the goal. City attacked back and pushed high, but a Peterborough counterattack saw the defence stretched and that pesky forward managed to score an almost identical goal but deftly deflecting the ball in the goal. Despite going from leading to losing in the space of 5 minutes, City kept up the pressure. Peterborough resorted to time wasting tactics and focused on holding the ball up. City could sense time was running out, but they just couldn't break down the Peterborough defence who crowded the D.
Once again a loss for the 3s, who made Peterborough work hard for their win. All City players worked hard in the game and kept positive throughout. A New Year Resolution is needed for the next half of the season: Do better in the second half! With yet again a different line up, City played at home to Kettering in a game where they hoped to at least get a point. City started well and put pressure on Kettering early and half way through the first half were rewarded with a goal for Ross Butler. Kettering put together some quick attacks and the City defence had to work hard to keep track of the ever switching Kettering forward line. One forward manage to round keeper Luke Ewles and it was a goal line save by Adam Sayer that kept Kettering from equalising. The second half saw City have possession early on and here is where we enter the realm of "What if.." In the space of 10 minutes, City had 3 good chances of scoring, all of which they failed to put away. A couple of short corners also were not converted. With the potential match-killing chances squandered, Kettering pushed for a goal and equalised from a short corner. They then took the lead from poor marking at the back, allowing a forward to get behind the defence. City fought back and Ben Withers managed to score a lovely reverse stick shot to bring the scores level again. A short corner for Kettering resulted in them scoring once again. City scrambled for a late equaliser, but it wasn't to be. Another game, another half time lead, another match given away in the second half. Despite periods of excellent play and a fantastic work rate from City, it was hard not to feel frustrated at the final result. Next week City play Peterborough and hope to improve on their 3-1 loss earlier in the season. it was never going to be an easy game for City this week: a depleted side missing regular players, travelling and playing a team who haven't lost a game this season. Then throw in the fact that for Bury this was a memorial game which featured players who had travelled from afar to play in this game, and then it becomes clear that City were up against it from the start. An incident in the first 5 minutes where skipper Adam Sayer took a ball to the head and had to sit out for a few minutes, set the tone for the game to come. Bury were quick and direct, and very clinical in front of goal. City came close with a couple of chances in the first half, but at half time, City found themselves trailing 4 goals. The second half was a battle again, but City just couldn't stop the onslaught. Absolute credit must go the City players who kept battling on, and did not complain once, nor utter any negativity, despite 3 Bury players being carded for aggressive tackles and back chat. A 9-0 loss, hard to take, but City once again held their heads high and kept battling to the end. POTM: Tobias Leonard - Caused Bury to worry...abit. TYFC: Murray Breetske - When do you leave? City travelled to Dereham on a very sunny afternoon. City were the first out of the blocks and scored when Rees Leonard slotted the ball past the Dereham goliath of a keeper. Dereham soon became frustrated by City as they couldn't seem to get anywhere near the ball. City passed the ball beautifully and kept the pressure on. Dereham managed to get an equaliser but it wasn't long until City took the lead again from Jack Luther knocking the ball through the legs of the keeper. City then managed to get another goal from a drag flick by maestro Rees Leonard. The second half saw Dereham put a high press on City and City struggled to get the ball to the forwards as every ball seemed to be cut out in the middle of the pitch. Pressure and a physical game from Dereham resulted in them not only scoring two goals to equalise, but also a further two to take the lead. All within a bad spell of 10 minutes. City fought back and Rees Leonard managed to bag himself a hat trick, but City just weren't able to compete with the physical side of the game that Dereham brought in the second half. The match ended with a Dereham win 5-4. City were frustrated to let the lead slip again, but can hold their heads high as it could be said they had the moral victory. MOM: hat trick hero Rees Leonard. TYFC: Captain Adam Sayer - shower gel explosion. A BRILLIANT BATTLE IN THE SUN EARNS CITY A POINT! HEADLINE: A brilliant battle in the sun earns City a point! Facing a 2nd in the table team when you are bottom of the table is never going to be easy. However, the difference in positions in the table was not apparent in the first 10 minutes when City put the pressure on Cambridge and came close to taking the lead. Cambridge then settled into the game and starting to put together some well-worked attacks together to probe the City defence. Jim Pallister and Adam Sayer held the back line, whilst Sam Clabon and Elliott Fox provided outlets down the side. It was City who struck first when Dan Cheesman put a ball into the Cambridge goal, however the lead was short lived as Cambridge soon counter attacked and the scores were level again. A wonder goal from Murray Breetske gave City an equaliser after Cambridge had taken the lead, and another goal came for Rees Leonard from a short corner to once again draw the teams level at half time 3-3. City had played a great half and were keen to repeat their efforts in the second half. Hard work in midfield from Tom Ling, Lloyd Sayer, Paul Roy, Ben Withers and Willem Wabiaut kept the City attacks up and another goal came for Rees Leonard from an expertly placed short corner drag. The forwards kept putting pressure on the Cambridge defence with Will Kidner and Breetske coming close to taking the lead even further. A very close chance came Willem missed what can only be called a "golden opportunity" which would have killed the game for sure. A misplaced pass caused Tom ling to double his efforts in his tackling, leading him to have a rest at the side of the pitch. Cambridge didn't give up and they were rewarded with a goal which resulted from a very fortunate bounce of the ball and a sweet strike which knocked it past City keeper Luke Elwes. The game finished a 4-4 draw with City pleased to take the point away, but also thinking what could have been. A fantastic team performance against a strong opposition and a hope of things to come! 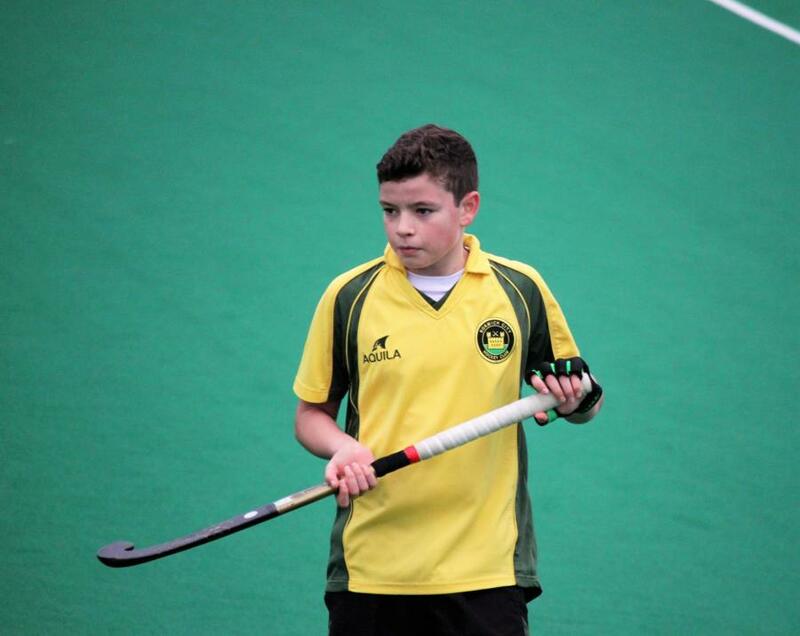 TYFC: Tom Ling - seeing yellow! CITY GIVES A GOOD GAME TO A SHARP NOMADS TEAM! HEADLINE: City gives a good game to a sharp Nomads team! This was always going to be a difficult match for the Mens 3s, playing top of the league Cambridge Nomads 1s. With a team containing two debutants in Elliot Fox and Joseph Roy, City were focused on playing good, positive hockey. City found themselves behind within the first few minutes, after a breakdown of play in midfield led to a swift attack from Nomads which they took full advantage of. It wasn’t long before Nomads added a second to their tally and City knew that they needed to wake up if they wanted to stay in the game. For the remainder of the first half City worked hard across the pitch and pressed well, causing a few errors by Nomads. City upped their passing game and soon had a few chances of their own. Unfortunately, none of these proved fruitful and half time was met with a scoreline of 2-0 to the visitors. City hoped to start the second half as they had ended the first, however as time wore on City grew tired and the sharp Nomads took full advantage. A quick succession of goals meant that the game was out of City’s reach, but they still continued to work well as a team and tried to play the nice hockey that they set out to. The match ended 7-0 to the visitors, but City can hold their head high as there was lots of positives to take away from their performance. MENS 3S POOR FIRST HALF IS THERE DOWN FALL! HEADLINE: Mens 3s poor first half is there down fall! With a slightly depleted team this week, the Mens 3s took on Dragons 1s who were up for it from the start, some lack luster defending in the first half left a lot to be desired with the team 4-0 down at the break. A much improve 2nd half performance gave City some hope going forward as one fluky reverse stick goal was all Dragons could muster as City had much more of the ball and chances in the 2nd half. City's youngsters Rafe Lochore, Sam Hyatt and Toby Pallistar can all be proud of their performances and it is great to see youngsters at this early age playing so well. The future looks bright! City started this game by playing some wonderful hockey that created chances, which for a change this season, were put away. Rees, Murray and Perry all scored in the first half to give City the lead. St Ives were becoming ever increasingly frustrated as they couldn't get the ball moving against the City pressure. If only the match finished at half time. The second half saw St Ives score early on due to a sequence of poor passes, and it wasn't long until they scored another with poor defending. This spurred them on and their confidence grew. City had fewer chances in the second half but did have a number of short corners, including shots that hit the post and forcing a few saves by the keeper. Lloyd scored one of these chances, however St Ives soon scored again and a final goal for them made the scores level. City felt hard done by after a short corner strike was saved, and the follow up shot to go in, only for it to be disallowed after the umpires conferred. A short corner in the last 30 seconds of the match came to nothing and the match finished a draw, leaving City frustrated at having thrown away the lead and for decisions not going their way. MOM was Toby Pallister for outstanding work in the middle of the pitch. TYFC: Dan Cheeseman for taking a break after contesting an umpire's decision. City once again demonstrated that they have what it takes to win games in this league, with the exception of one thing: scoring goals. From the start City knew it wouldn't be an easy game and a few decisions did go against them, but City kept their heads and created chances. Chances that weren't finished off and were slowly building frustration. Eventually a goal did come for City when Rees Leonard slotted the ball through the Peli keeper's legs. This fired up Pelicans who immediately upped their game and their physical presence leading to pressure on the City back line. Unfortunately for City this pressure allowed a ball hit into the D to find a Pelican player by the back post who knocked in the ball to equalise. The second half saw both teams have chances, but it was City who had the most. As mentioned earlier, these chances weren't put away and it was to cost City dearly. In the last 10 minutes, pelicans hit the ball into the D, for a forward to get a lucky touch on the ball which deflected it into the City goal. The game finished 2-1 to Pelicans and left City frustrated as they knew they should have won comfortably. Not taking chances and poor marking/fitness were the culprits of the day. Man of match: Luke Elwes in goal, a strong debut. City hosted Long Sutton 1s who have recently dropped down from Div 1. The action was end-to-end throughout the game, with City having the most of the ball. Early on, City won a a couple of short corners, which they failed to convert. This was to be the pattern of events for the rest of the match. A goal for City from International player Murray Breetske brought City level after Long Sutton had pulled ahead. A short corner was slotted away by Chris Perry who calmed flicked the ball into the net. Long Sutton managed to equalise with a precise flick from an obscure angle, meaning the teams were level at half time. The second half saw City have the majority of chances, with perhaps a total of short corners numbering in double figures, but nothing seemed to fall right to clinch the winner. The game finished a draw and City felt frustrated to have squandered so many chances. Certainly work to be done on short corners! Special mention to Sam Hyatt and Toby Pallister who played well and confidently throughout the game. A LOSS, BUT A POSITIVE ONE! HEADLINE: A loss, but a positive one! The first league game of the season saw the 3s travel to Peterborough for their return to Division 2N. Missing a few regular players, emphasis was put upon keeping the ball, passing smartly and staying positive. City started well and there were soon chances at both ends. City passed the ball well and worked as a team, moving the ball confidently up the pitch. After 10 minutes, Peterborough claimed their first goal, when an attacking player swung their stick, hitting the city player's stick out of the way, allowing the attacker to shoot and score. City didn't let this deter them; Southgate and D Fletcher both performed well on the left and right of the pitch, providing space and an outlet. Tiring work in the middle for L Sayer, Silvester and T Leonard, but they linked up well and fed the forwards. A wayward pass led to a Peterborough attack, which resulted in a short corner. From this they scored to lead 2-0 at half time. City came out strongly in the second half, despite being behind. Peterborough certainly had something to worry about, as Cooke, Kidner, and Breetske battled against their defence. A short corner breakdown for City led Peterborough on the counter attack, and despite the efforts of A Sayer and Ling at the back, couldn't stop the overload of players coming through. City didn't give up, and their effort was rewarded with an expertly taken drag flick from R Leonard, gave City their first goal of the league season. Special mention to goal keeper Joe K who made many a fine save and was a presence throughout the game. A loss, though a positive game for City, who were unsure of the level of hockey within Div 2N. If City continue like this, then it will not be long until they pick up their own points.